With a tagline like “a view with a room” one thing is clear: On The Beach Boutique Guesthouse and Suites in Jeffreys Bay is all about delivering spectacular seascapes. Its picture-perfect Indian Ocean backdrop will take your breath away, and being set right on the beach, this relaxed and gorgeous place encourages you to immerse yourself in the luxury beach life. Modern and stylish interiors complement the classic design, with a distinct harmonious ambience helping to create a space in which relaxation and comfort is paramount. There are 11 tastefully decorated room options, ranging from studios to two-bedroom suites, most of which offer exceptional sea views and direct beach access – this really is beach living at its very best. Watch surfers and dolphins playing in the water as you surrender to the serenity of your surroundings. An upstairs lounge, bar and outdoor verandas all provide ideal places for kicking back and enjoying yourself, ensuring that you leave feeling rejuvenated and as if you’ve been away for ages. There is complimentary use of beach chairs, umbrellas, so you’ll have everything you’ll need to take full advantage of the outside areas and really enjoy the sunshine during the warmer months. You’re also able to experience the magic of a sundowner braai (barbeque) right on the edge of the beach. Braai facilities and picnic tables are available in the front of the guesthouse, either on the front manicured garden lawns that lead down to the beach or on the sand lower down. The braai room is fully equipped with everything you’ll need to enjoy a delicious meal. Fall asleep each night to the soothing sounds of the waves – a gentle reminder of the healing powers of nature for mind, body and soul. The Penthouse Room is on the first floor with exquisite 180-degree beach and ocean views. Room facilities include air-conditioning, seating area leading onto the upstairs patio, 32"LCD TV with DStv bouquet, tea and coffee-making facilities, full en-suite bathroom with double showers and center bath - all with views. Free Wi-Fi, beach towels, chairs and umbrellas are supplied for your convenience. This room can accommodate up to two adults in king-size/twin beds, including a cold buffet and hot a’ la carte breakfast menu. The Deluxe open plan Rooms on the ground floor, have full en-suite bathrooms, seating area and sliding doors leading onto a patio, with beautiful ocean and beach views. Facilities include underfloor heating, fan, sleeper couch (suitable for maximum 2 children 10 years and younger at R300.00 extra per child, combined age of children may not exceed 16 years), 32"LCD TV with DSTV bouquet, tea/coffee facilities and King/twin beds. All rates include a full cold buffet and hot a’ la carte breakfast menu. The Superior Rooms on the ground floor has breathtaking beach and ocean views, with sliding doors leading onto a patio, the garden and the beach beyond. Room facilities include sitting area, under-floor heating and fan, or air-conditioning, 32” LCD TV with DStv bouquet, tea and coffee-making facilities, full en-suite bathroom, and direct beach access. Beach towels, - chairs and umbrellas are supplied for your convenience. This room can accommodate two adults in a king-size/twin beds. All rates include a full cold buffet and hot a’ la carte breakfast menu. The Luxury Room is situated on the ground floor with partial ocean views. Room facilities include 32” LCD TV with DStv bouquet, tea and coffeemaking facilities, full open-plan en suite bathroom, direct beach access and access to all guesthouse amenities. Free Wi-Fi, beach towels, - chairs and umbrellas are supplied for your convenience. The Standard Rooms on the ground (king/twin beds) and first floor (double bed), are small, yet comfortable with all amenities, en-suite bathroom with shower/full bathroom. 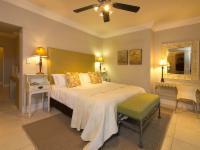 The room facilities include a fan, 32”LCD TV with a DStv bouquet and tea and coffee facilities. These rooms DO NOT have any beach or ocean views. This room can accommodate two adults only. The Studio Rooms, perfect for corporate as well as leisure guests, are located on the first floor with lovely beach and ocean views, king/twins beds with full en-suite bathrooms, seating areas with sliding doors looking out onto the ocean. Facilities in the rooms include Wi-Fi, kitchenette cupboard with microwave, fridge, crockery and tea & coffee-making stations, air conditioning, 32” LCD TV with DSTV bouquet, DVD player, radio, laptop-sized safe and iron and ironing board. We have Private Balconies for this 2 rooms. 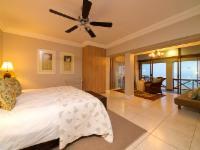 The Two-bedroom Suites are located on the ground or first floor, with lovely ocean and beach views. The comfortable open-plan living rooms, with dining area and kitchenette, are air-conditioned, with sliding doors leading onto a private balcony/patio. Facilities include full, modern bathroom, private entrance, remote alarm system, 32″ LCD TV with DSTV bouquet and daily service. These suites can accommodate up to 4 adults and 1 child under the age of 10 on a sleeper bloc in the lounge. RATES DO NOT INCLUDE BREAKFAST. "Hello, I would like to confirm that we had a very enjoyable stay at “On The Beach Guest House”. 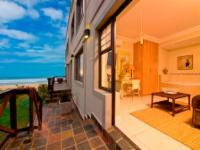 We had a very warm welcome on arrival and a fabulous room overlooking the beach – we had booked the Penthouse Suite. The Guesthouse Management were extremely helpful in making a restaurant reservation at “Kitchen Windows” restaurant and providing a free shuttle to / from the restaurant. Breakfast was excellent. We only stayed one night and should we need accommodation in Jeffreys Bay again would definitely return to “On The Beach Guesthouse”. " "A wonderful appartment with all you need, a balcony with view to the sea and a lot of space for us all. We were lucky to see a red full moon rising over the sea - and next moring a beautiful sunrise!! Unforgetable!! We certainly will come back!!" "On The Beach offered exactly what we were looking for: Privacy when we needed it, a perfect setting literally on the beach, and close proximity to all amenities when we wanted it. We certainly recommend staying there." Take the first Jeffreys Bay off-ramp onto St Francis Road. Take the next road left into De Reyger Street. Turn left into Da Gama Road at the first traffic lights. Pass the first 4-way stop street and take the first right into Waterkant Street (Impala Street if you turn left). Continue down until you reach the beach parking area, where On the Beach Guest House is directly on your right at 32 Waterkant Street. Take the second Jeffreys Bay off-ramp (not Mondplaas/(R102) Jeffreys Bay EAST) onto St Francis Road. Continue down until you reach the beach parking area, where On the Beach Guesthouse is directly on your right at 32 Waterkant Street. S34° 02' 21.16" E24° 55' 48.97"